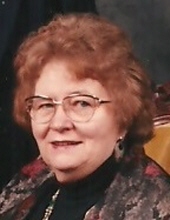 Gertrude Edna Loy age 89 of Arena passed away on Sunday, February 10, 2019 at the Maplewood Nursing Home in Sauk City. She was born on September 22, 1929 in Fox Hollow, Richland County the daughter of Glen Edward and Gertrude Jesse (Kanouse) Maly. Edna was married on October 16, 1948 to Willard John Loy. She owned and operated Edna’s Deli in Spring Green for 5 years and was a long-time member of the Spring Green American Legion Auxiliary. She enjoyed gambling, playing Euchre, visiting friends, the Green Bay Packers and Brett Favre. Survivors include her 4 children, James (Chris) of Reedsburg, John (Tim) of Eau Claire, Sheryl Loy of Sauk City, Roxana (Pete) Nelson of McFarland, 12 grandchildren, many great and great great grandchildren, a daughter-in-law, Marilee Gilbertson, a sister, Ada Balsley, other relatives and friends. She was preceded in death by her parents, Glen and Gertrude Maly, her husband, Willard Loy, a son, Glen Loy, a brother, George, 4 sisters, Eva, Elsie, Hazel and Gladys. A visitation will be held on Saturday, February 16, 2019 at the Richardson-Stafford Funeral Home in Spring Green from 12:00 Noon – 2:00 P.M. with burial to follow in the St. Barnabas Catholic Cemetery in Mazomanie. Online condolences available at www.staffordfuneralhomes.com. The Richardson-Stafford Funeral Home in Spring Green is assisting the family with the arrangements. "Email Address" would like to share the life celebration of Gertrude Edna Loy. Click on the "link" to go to share a favorite memory or leave a condolence message for the family.